← Pink Ribbon Products – Where Does the Money Go? How many are being sold? I was unable to find out how many boxes they are producing but did find a figure for dulcolax 2013 overall revenue of 150.3 million. That’s a lot of laxatives! ……………………….. Which charity is receiving the donation? Susan G. Komen ……………………. Is the pink product comparible to the regular version in price and/or quantitiy? Some versions contain less product than the regular version. One store had a bonus box that contained more. Prices varied by store. Sometimes more for pink, sometimes less. …………………….. 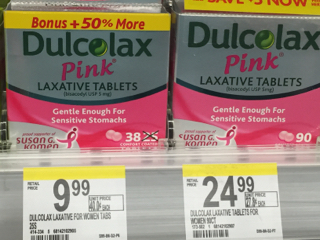 Pink won’t cure cancer and I can’t imagine it will make the laxatives any more effective. I think the only benefit of this campaign is the sheer number of poop jokes it will generate and I hope that is not their intention as breast cancer is no joke. I’m choosing laughter over tears and trying to picture the field day they would have on late night talk shows with this one. If you care to join me feel free to post your suggestions in the comments. Kind of a MAD LIBS for Pinktober. Bonus points for an over all ad campaign slogan. This entry was posted in causemarketing, pinktober, pinkwashing and tagged #pinktober, #pinkwashing. Bookmark the permalink. 2 Responses to Get Things Moving for Pinktober? I still wonder what they were thinking when they decided on that particular product/cause partnership, but if nothing else I’ll give them a few points for humor value however unintentional. Kelli Parker had a hilarious post on Facebook yesterday. I think the hashtag was #pooptober. Thank you for taking the time to read my post and comment. I really appreciate it!